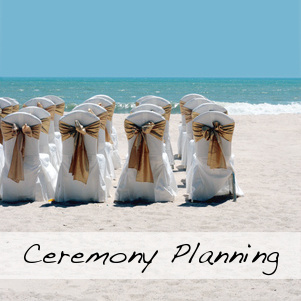 Your beach wedding ceremony decor can be as simple or as elaborate as your individual tastes as a couple. Sometimes I personally think that simple is often better when it comes to having this intimate part of your nuptials on a beautiful beach. Of all your beach wedding ceremony decor your gazebo or arch would most probably be your focus point and also the point where you want to concentrate most of your decor effort on. 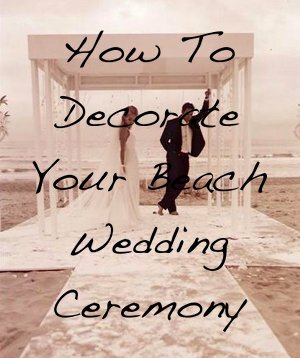 Even if your beach wedding ceremony decorations will not include any chairs, you will still want to get married under a pretty gazebo kind of structure or an arch or backdrop. You can either buy or hire a portable White Wedding Gazebo. Don't just think of the type of canopy hawkers use at your local market, many function hire companies have special gazebos or Chuppas for weddings. 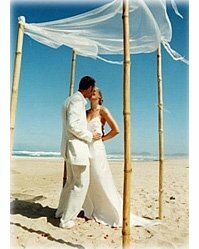 You can also create your own beach wedding canopy with driftwood or 4 pieces of bamboo and a gauzy type of material like tulle or organza. Decorate with strings of flowers and shells, storm lanterns, pieces of fabric or hang rosebuds or little vases with flowers in different lengths from pieces of colored ribbon. 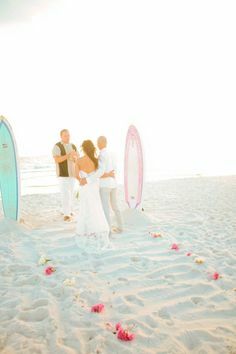 Or check out some more ideas on Beach Wedding Ceremony Decor Here. 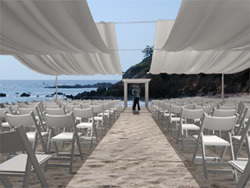 Pew markers offer you great opportunities for beach wedding ceremony decor as it will not go unnoticed - everyone needs to walk down the isle to their seats. If you don't want to decorate the pews, then you can also decorate your aisle. For a luxurious and upmarket feel hang lush tassels in a neutral sand color from your pews and attach starfish or beautiful shells to them. 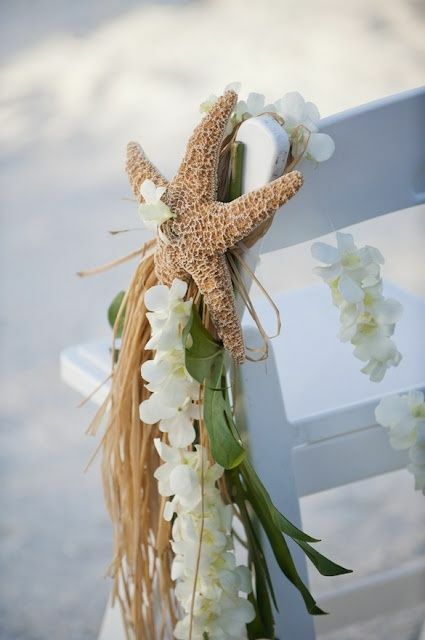 For something a little more basic and budget friendly, simply tie some raffia or ribbons in your colors to two points of the starfish and hang them to the chairs by this. Simple but beautiful! Decorate your pews with simple palm leaves that are cut to size and then hung over the pews with some string or ribbon. If you are looking for some more color then add some tropical flowers, leis or even shells. 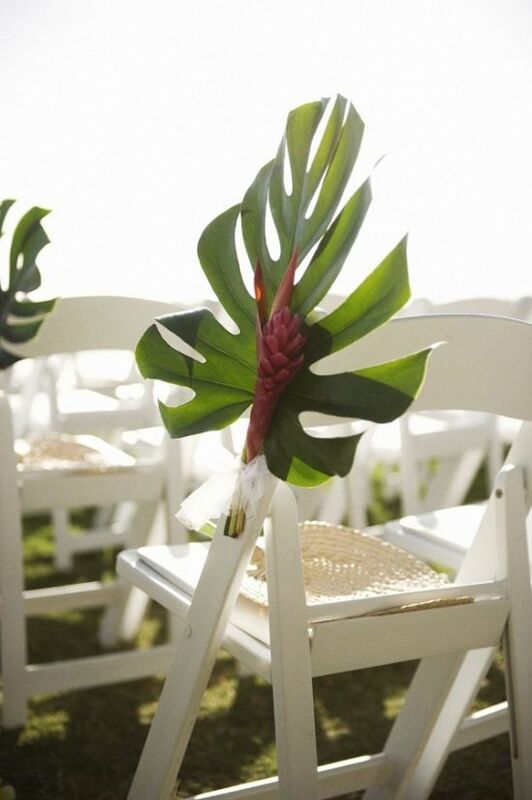 Have a florist make Hawaiian leis out of tropical flowers to drape over your pews, or make your own leis. 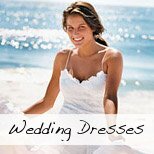 You can use real flowers, artificial flowers or even incorporate shells and small pieces of driftwood if your ceremony is not really "tropical". If you use flowers you make yourself or artificial flowers you can make these days or weeks before the wedding and it would be quite economical too. Are you or your future spouse avid surfers? 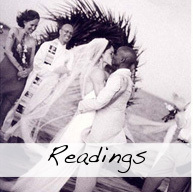 Bring this part of your life into your beach wedding ceremony decor. Cut out small surf boards from balsa wood and paint them in your chosen colors. Write your names and the date of the wedding on them and hang on each pew. They also make great keepsakes! Fill tin or plastic buckets with your chosen flowers and hang them just like that over your chairs or on shepherds hooks. Or if pails are not your thing, how about some simple glass jars? Jam jars are perfect and come in many sizes. 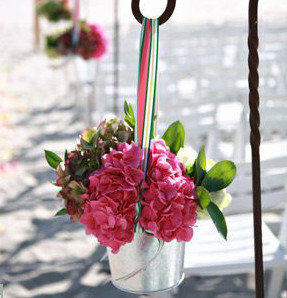 Fill with flowers, tie a string and hang. Just gorgeous! 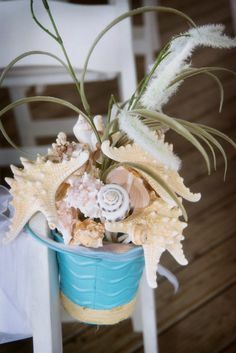 Instead of using buckets or jars filled with flowers like the example above, why not fill the pails with some beautiful shells and starfish? This can look stunning if you also incorporate some green or perhaps some succulents. Hang them over the side of the chair like in the picture, on shepherds hooks or simply on the floor. If you don't like the idea of pew markers or perhaps you don't have chairs with anything to hang something from, then shepherds hooks might be what you were looking for. 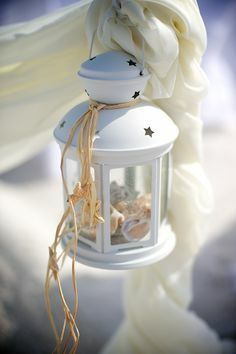 You can use them in many ways for your beach wedding ceremony decor - hang storm lanterns filled with flowers, buckets or jars of flowers, pomanders, Chinese lanterns or anything else your imagination comes up with. 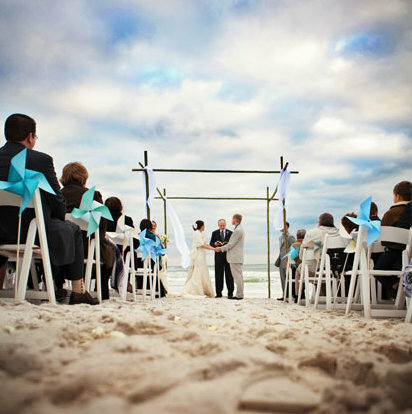 Storm lanterns or any nautical style lanterns can make great beach wedding ceremony decorations. If you want a minimalist look for your ceremony decor then simply place them down your aisle with flowers inside or even candles if you are having a sunset ceremony. Or you could hang them from the pews with some draping as in the photo. 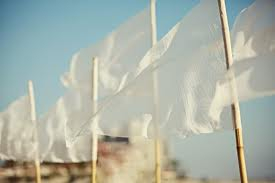 Make simple flags in your colors or in a gauzy white material and attach to some sticks of bamboo. This is a very simple decor idea that is easy to make and inexpensive too. It also looks great if there is a slight breeze. 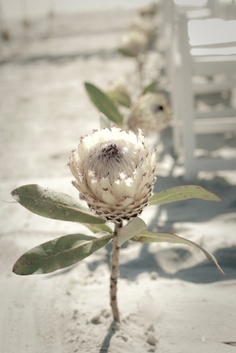 Tie a large, single flower like a sunflower or a Protea to every pier or just plant firmly in the sand for something simple but utterly beautiful and summery. The flowers in the picture to the left are Proteas from South Africa. You could also use sunflowers or any large, robust flower. Large single leaves like the leaves of the Delicious Monster (or palm leaves, banana leaves etc) used in the photo on the left, alone or combined with another element like a single flower or starfish can make a striking and cost effective beach wedding pew decoration. 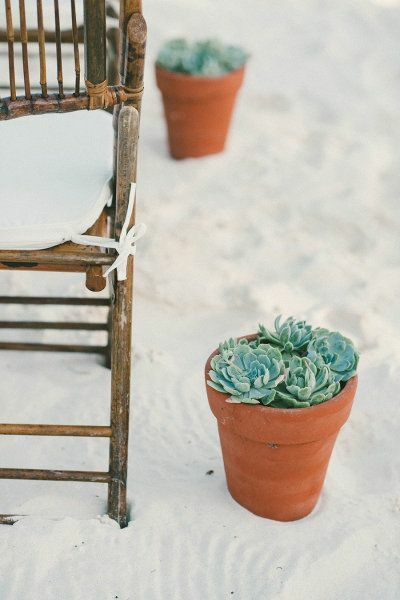 Another alternative to using flowers to line your aisle is to use succulents and cacti in terracotta pots. You could also use colored tin pails as containers coordinated to your wedding colors. If you love the rustic look of burlap then this one is definitely for you. 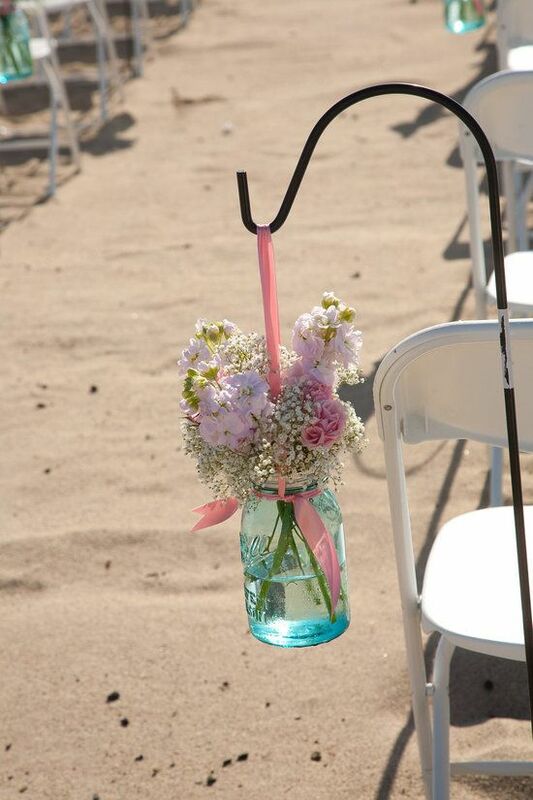 Also another alternative to using flowers to decorate your beach wedding aisle. Simply plant some grasses in pails and cover the pails with burlap. Simple, rustic and gorgeous! 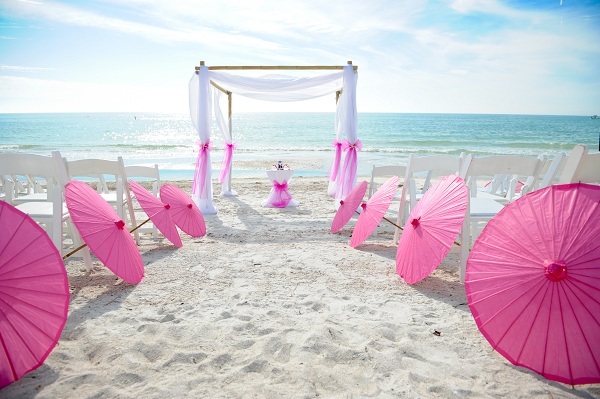 Parasols do double duty as they not only make a stunning display of color for your aisle, they also serve to protect your guests from the sun! 1. 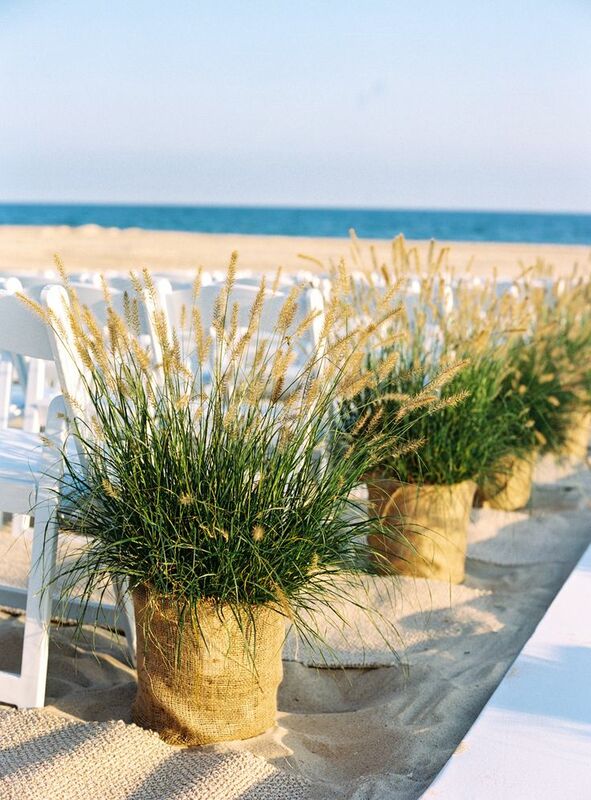 If you are not using pew markers, then line your isle with palm branches and tropical flowers, sunflowers, Bamboo & Seashell Tiki Torches, paper luminaries, fabric flags, vases with flowers or even pinwheels in your wedding colors for a dash of fun. 2. Build a wooden isle and paint it white for a contemporary feel to your beach wedding ceremony decor. 3. Instead of a traditional red carpet, have Material Isle Runner (you can even monogram it if you like). Just make sure you weigh it down properly or the wind might take it! 4. 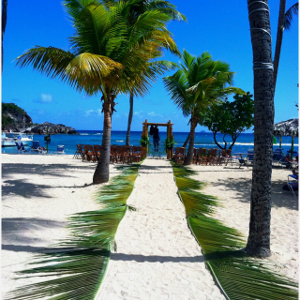 For an island feel to your wedding how about a grass matte aisle runner? 5. Want a truly gorgeous ceremony decor idea? Arrange some petals or flowers in twirly patterns (or even in your initials) on your aisle for something truly unique and very pretty. 6. Create an "entrance" to your wedding ceremony area by having an arch or doorway (can be complete with open doors) at the beginning of the aisle for you and your guests to walk through. This should complement the decor of the gazebo you are using. 7. Instead of the normal straight aisle, why not have a winding aisle? 8. Plant poles on all 4 corners (4 should suffice for a small ceremony) of the patch of beach you are thinking of utilizing. 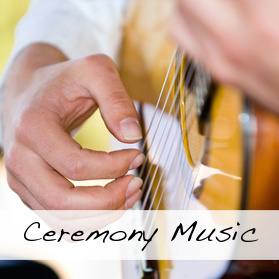 Plant another 2 or 4 at intervals on the outside (depends how big your ceremony space is). Tie pieces of sting from one to the other and hang large pieces of fabric over the seating areas. This not only creates a stunning visual affect, but will also give much needed shade to your guests. A great wedding decor idea if you have some time to set up and some money to spend on it.